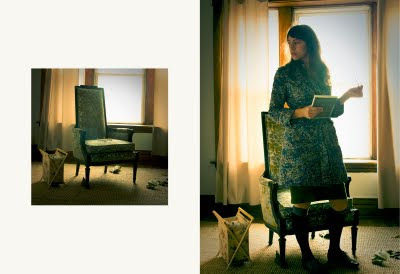 I love the style of the Anthropologie and Urban Outfitters catalogs. It's graceful, simple and well, dreamy. It mixes vintage settings and tones with modern living situations. It's a look that many retail stores like and customers can relate to. I also affectionately call it "shooting like a girl" with some envy for photographers who have mastered it (darn you Chloe Scheffe!) . The photos above are the result of me having a stab at it. The first set was shot in an old apartment in Chicago (hey Angela!). I used only window light, a large white sheet as a reflector to camera left, about 5 feet from the model and a camera almost literally grabbed from a friend who happened to be there. The second set up was almost equally minimalistic: the model (hey Tiffany!) got hair and make up done in my studio and we walked out to a small city garden in Seattle. I used a simple ring flash modifier attached to my hotshoe flash (see this post) and exposed the flash at about half a stop below ambient. Then I used Lightroom to add the "Holga/Vintage/Polaroid/Artsy" look to it. 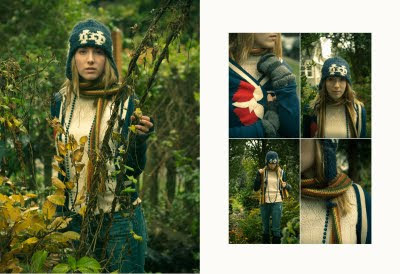 Both sets featured several Anthropology clothes and accessories (and my dad's thirty year old scarf). What's not to like? This images would form the core of a relatively low budget ad campaign perfect for a fashion store or an up and coming apparel designer. I like. Hard Punk Rock Light. Black Patent Shoes.